At a museum function devoted to a private weapon collection on loan by Bruce Wayne a woman with a skull tattoo on the back of her neck catches Bruce's eye. He follows the woman, who takes a piece off of one the exhibits, which summons Silver Banshee. Superman arrives as the Banshee starts an incantation but is driven back by the Banshee's cry. Bruce manages to change into his Batman uniform, but he does no better and despite his better efforts succumbs to the Banshee's wail. Superman gets Batman to safety and both he and Alfred are astounded when Bruce miraculously revives in the Batcave. Superman returns home and is shocked when his power of flight goes out. Meanwhile Batman and Robin track down a group of smugglers. Batman begins to become aware that something is amiss but they go in anyway. One of the thugs hits Batman with a rocket and Robin is shocked at what he finds when he finally reaches his mentor. Back in Metropolis Clark finds Lois, who wants to know what happened. Suddenly Batman arrives floating above them with his eyes burning red. Is this really what DC wants to do with this title? I mean are they really going to pull a plot from 1962, dust it off, throw some characterization into it, tell us, "Well, we just wanted to explore what it would be like if someone like Batman suddenly got Superman's powers," and expect us to just...take it? I knew that liking the last two issues was going to come back to haunt me. Well, I really don't know when they'll stop. I got the point about a year ago. It's the same thing over and over again with a new coat of paint. Take the opening of this story. 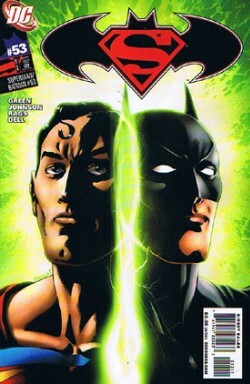 Superman and Batman trade places and fight crime in each other's cities. Why? To show us how different they are. Then we see Bruce and Clark meet at a social function and the two don't know each other...again. Then they fight Silver Banshee and somehow Superman's power gets into Batman's body. Then they separate and Batman discovers that he has Superman's powers. Superman trashes his own apartment, Batman shows up, flying no less and the issue is over. So not only is it a bad idea it's a bad idea that is getting padded out over an entire storyline. Can someone tell me why this title is still being published? Do the monthly sales justify it? Do the sales of the trades justify it? Can someone just tell me what's going on? Not really, but still. I was trying to be positive. Art - 3: I wasn't really thrilled with Rags Morales' artwork in this issue. Normally I like Rags' work. I really do. Something was just off here. It's not the page layouts or the action. Everything was there, it's just the detail was off. It didn't look right, at least to me. Though I will begrudgingly say the last page was kind of neat even if he went for the whole burning red eyes thing. Because no artist has done that before, have they? Cover Art - 2: There is nothing to like about this cover. The heads look weird and the background isn't doing anything for me. A pretty standard cover really. Nothing exciting or ground breaking. Was there anything about this issue that I liked?